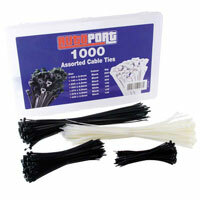 Keep wires, cables and all sorts of equipment tidy and organised with a box of cable ties from Euro Car Parts. Take a look at the range we offer below. Keep your work space neat, tidy and organised with the range of cable ties we have available at Euro Car Parts. One of those essential items that are great to have at your disposal, cable ties are a really versatile accessory. Whether you’re organising wirelooms and need to keep them stored neatly out of the way, or are working on a particular task that requires holding certain components away from the area you’re focusing on temporarily, a cable tie is a wonderfully simple tool. Above you’ll find cable ties from the best brands available, in a range of prices, colours and lengths. What’s more, you can make the most of our free UK delivery service, or free click and collect service to one of our 200 branches nationwide – browse the range today and if you have any queries, don’t hesitate to call us and speak to a member of our team, we’re always happy to help!